Visit NASA Ames Research Center in Mountain View, Calif., and it’s impossible to miss Hangar One: a hulking mesh of metal that stands 1,133 feet long and 198 feet high. Once famous for the naval technology developed there, Hangar One was labeled in 2008 as one of the most endangered historic sites in the U.S.
After spending years debating the hangar’s future, NASA announced today that it has begun negotiating a lease agreement with Planetary Ventures, a little-documented limited liability company that is a subsidiary of Google(s goog). 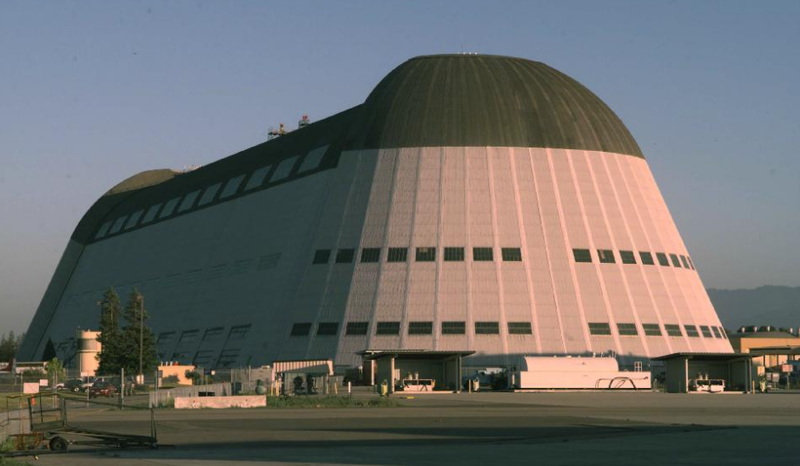 Planetary Ventures will be responsible for rehabilitating Hangar One and operating the associated Moffett Federal Airfield. The Mountain View Voice reports the job will cost $40 million. The airport is currently operated by NASA Ames Research Center, which sits next to the hangar. Planetary Ventures will take over all of the operating costs. It will also be responsible for covering the hangar’s metal skeleton with siding and restoring the two other historic hangars on-site. How Hangar One once looked before its exterior was removed. Photo courtesy of NASA. NASA Administrator Charles Bolden said in a release that the agreement will allow NASA to continue using the airport on a limited basis while cutting overall costs. Google leaders have approached NASA in the past about leasing Hangar One. The company’s top three executives offered in 2011 to pay the $33 million needed to restore the hangar in return for NASA housing the executives’ fleet of airplanes. It’s not clear if this week’s news amounts to just another chance for Google execs to have a place to store their planes or if the site will serve another purpose. Considering that you could fit six football fields inside Hangar One, it could very well be both. This post was updated at 5 p.m. PT to state that Planetary Ventures, not Planetary Resources, is in negotiations with NASA. The two companies are not related. I’ve never understood why so many, especially the intelligent folks at Google, are so excited about Moffet Field, especially considering it’s a known cancer-causing environmental catastrophe with all those toxic chemicals in the soil.